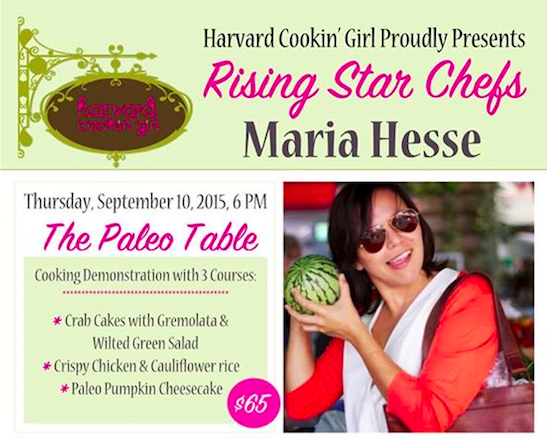 On Thursday, September 10, starting at 6pm, Harvard Cookin' Girl will continue its "Rising Star Chefs" dinner series and feature Maria Hesse, co-author of 'The Intentionalist Cooks!' and San Diego personal chef. At the event, Maria will demonstrate how to cook Paleo-centric and gluten-free dishes which will then be offered to hungry attendees. Maria Hesse's French and Asian heritage exposed her to bold flavors and techniques that she incorporates into menu planning and meal prep for exclusive clients on an array of restrictive diets. For the "Rising Star Chef" series, Maria is going to develop and teach simple, healthy, Paleo-centric and gluten-free/vegan classes. Her first open class at Harvard Cookin' Girl will demonstrate how to cook herbed crab cakes with Gremolata and wilted green salad, crispy chicken and cauliflower rice, and finally, Paleo pumpkin cheesecake. All dishes will be served following her demonstration. This event is $65 per person and registration can be secured online at harvardcookingirl.com/event-registration/?ee=403. Harvard Cookin' Girl is located at 7441 Girard Avenue in La Jolla.